Rituals is a brand that’s been increasingly gracing my bathroom over the last year or so thanks to its high end, luxurious feel but more affordable, mid-range prices. The latest Rituals Summer 2014 Limited Edition range is inspired by the country of India and the symbolism they place on flowers. Thankfully, that doesn’t equate to a stale and dated old-lady floral scent – far from it. In fact, it’s all very fresh, clean and modern. In India, fresh flowers are commonly offered and given as gifts as a symbol of love and devotion – n’awww. The Lotus flower in particular is considered a symbol of beauty, purity and enlightenment. To this end, White Lotus and my favourite citrus scent, Bergamot, come together in the Rituals Summer 2014 collection to create a subtle yet stunning summery fragrance. 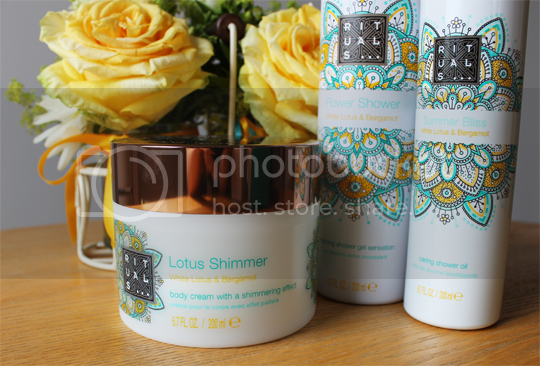 First up, the Lotus Shimmer Body Cream* (£18.50). Thick, rich and sumptuous, Rituals body butters really are little pots of joy. This one is infused with a gentle shimmer – worlds away from the chunky glitter gels I may or may not have adorned myself with at school discos in the 90s, don’t you worry – so not only does it give you silky smooth post-shower skin but a sophisticated glow, too. If I was a) slim enough to want to get my legs out in public and b) into the whole tanning thing, you can bet your bottom dollar I’d be slathering this all over freshly tanned pins and parading around in the sunshine. In other words, this will really complement a tan, so bronzed beauties should get all over it. Then we come to the shower bits. Flower Shower Foaming Gel* (£8.50) is the newest addition to Rituals’ collection of popular foaming shower gels. I’m not sure what it is about these that makes them feel so luxurious, since it’s essentially the same idea as shaving gel but they’re just lovely. I’ve been using the Yogi Flow one as a year-round treat for a couple of years now, but Flower Shower has definitely overtaken that as my favoured scent for summer. Next, if you want to get really indulgent (without spending a fortune), Summer Bliss Shower Oil* (£8.50) will be your new best friend. Shower oils tend to be on the expensive side, but Rituals are, as always, offering some pure luxury to those of us with a more modest budget. On contact with your skin and water, this sumptuous shower oil morphs into a silky cleansing foam – I’m not talking mountains of it like the foaming shower gel, but a gentle, barely there lather to get you squeaky clean while leaving your body nourished and hydrated. Beautiful stuff. A little goes a long way, too. Lastly, a Rituals collection wouldn’t be complete without a touch of home fragrance. There’s the Lotus Secret Scented Candle* (£18.50), which I’m burning right now as I type. With the same gorgeously calming scent as the body products and a burn time of 50 hours, you can create a soothing ambiance in your living room for much less than the likes of Diptyque or Neom. For those who prefer their home fragrance to come without a fire hazard, you can opt for the Indian Blossom Fragrance Sticks (£24.50), whose scent will gently permeate your room without so much as a flicker of a flame. 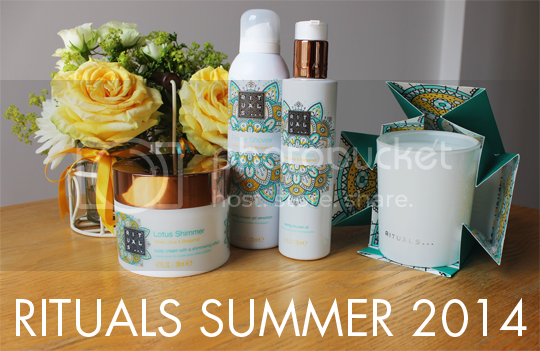 The Rituals Summer 2014 Limited Edition range is out now, available in Rituals stores and online. If you held a gun to my head and forced me to choose (which is a really jarring image after spending the last hour relaxing to the scent of the Lotus Secret candle), I’d say my top pick is probably the Summer Bliss Shower Oil but honestly, this is the most enamoured I’ve been with a body collection in quite a while so I’d quite happily recommend the lot. Well done, Rituals – beautiful as always. P.S. I have always vowed not to do that ubiquitous, pretentious thing that everyone does now by sticking a bunch of flowers in the background of all their blog photos. But I arranged those flowers myself, damn it, so indulge my newfound floristry talent (cough cough) just this once! I’m dying to try Rituals products and intend to pop in next month, I will definitely be checking out this collection! Does the scent from the body butter last long on the skin? I’m just wondering if it would clash with any perfume I would wear – thinking of getting some nice products for my wedding day. Yep that makes sense, want to check these out even more now! Thank you! This sounds like such a lovely range! I’ve recently started using Rituals Cherry Blossom Foaming Shower gel which is so gorgeous.